ESR Electroslag Remelting has been known since the 1930s, but it took approximately 30 years before it became an acknowledged process for mass production of high-quality ingots. The ESR technology is of interest not only for the production of smaller weight ingots of tool steels and superalloys, but also of heavy forging ingots up to raw ingot weights above 150 tons. In the ESR-process a consumable electrode is dipped into a superheated slag pool surrounded by a water-cooled mold. Electric current (usually AC) passes through the slag, between the electrode and the ingot being formed, and superheats the slag so that drops of metal are melted from the electrode passing through the slag to the bottom of the water-cooled mold and collect into the melt pool in solidification. The slag pool is displaced upwards as the ingot forms. The new ingot of refined material builds up slowly from the bottom of the mold. Such a homogeneous, directionally solidified ESR ingot will be formed, free from central void spaces and other defects typically occurring in conventionally cast ingots. The ESR process offers very high, consistent and predictable product quality. Finely controlled solidification improves soundness and structural integrity. ESR is recognized as the preferred production method for high-performance alloys that are used today in industries such as aerospace and nuclear engineering as well as for heavy forgings. Today´s computer controlled process automation allows automated process control featuring reproducible material quality. Important to mention here is ALD’s unique electrode immersion depth control and power based melt rate control. It can be stated that ALD’s ESR automatic melt control system (AMC) is unsurpassed in the world for its inherent features, ease of operation and last but not least its accuracy and repeatability of control, producing ingots with excellent properties. Tool steels for milling cutters, mining, etc. This laboratory system combines VAR, ESR, PESR, IESR and VESR in one furnace. 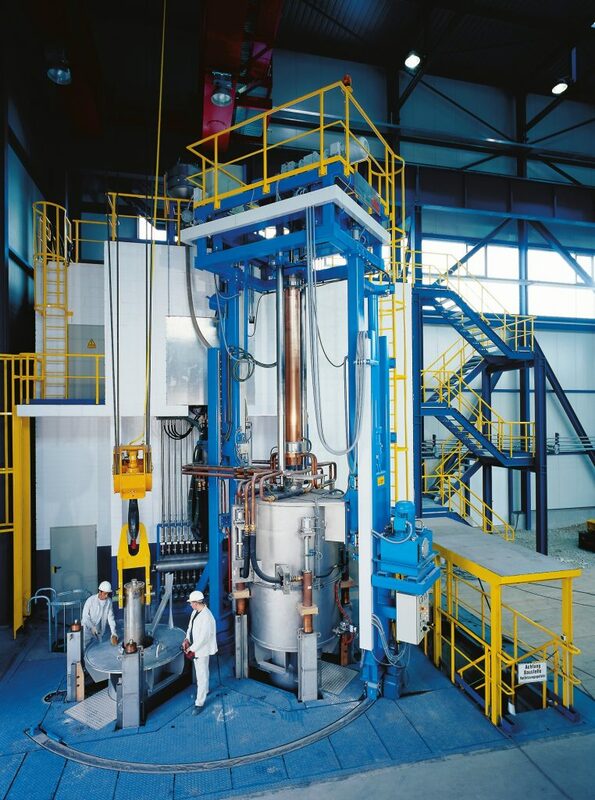 Different remelting processes can be carried out in one chamber type furnace using alternating or direct current to remelt one consumable electrode into one ingot, above (up to 70 bar) or below atmospheric pressure. With two fixed remelting stations and one pivoting furnace head. These are particularly suited for efficient production at high production rates. With a central ingot withdrawal station and electrode exchange capability, and an option with outer stations for remelting in stationary molds. The central station is particularly suited for remelting of large diameter ingots. Smaller diameter ingots may be remelted simultaneously in the outer stations. Completely sealed systems for ESR operations under vacuum, inert gas, or increased pressure. These systems are particularly suited for producing ESR ingots with high contents of nitrogen or reactive elements.